Sharjah 24 – SPA: The Custodian of the Two Holy Mosques King Salman bin Abdulaziz Al Saud received on Monday at Al-Yamamah palace Prime Minister of the Republic of Lebanon Saad Al-Hariri. 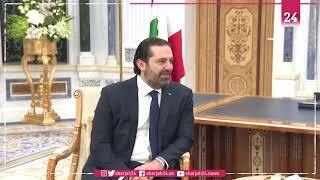 During the meeting, they discussed means of enhancing bilateral cooperation between the two countries and the latest developments in the region, especially on the Lebanese arena. The audience was attended by Minister of State and Cabinet Member, Dr. Musaad bin Mohammed Al-Aiban; Minister of Foreign Affairs Dr. Ibrahim bin Abdulaziz Al-Assaf; Advisor to the Royal Court, Nizar Al-Aloula; Ambassador of the Kingdom of Saudi Arabia to Lebanon, Walid bin Abdullah Bukhari and Lebanese Ambassador to the Kingdom, Dr. Fawzi Kabara.